Your Heater Deserves a Tune-Up, Today! October is here! We’ve been enjoying the cooler temps, and being able to be outside during the day without feeling like we’re melting. Soon enough, though, those temperatures will drop even lower, and when they do you want to make sure you have a safe and effective heating system in place to keep you warm this fall and winter. The “safety” part of the equation is even more important if you have a gas-powered furnace in place. Be sure to contact a professional HVAC contractor in Salt Lake City to ensure that your furnace is in good, stable condition and is prepared to provide you with not only optimal comfort this coming winter, but also optimal safety. 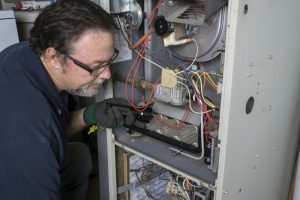 This is the most important part of heater maintenance—you don’t want to worry that your gas-powered furnace, for example, may become a danger during the winter. The gas-powered furnace is the most common type of heater used in Salt Lake City homes, which is why we’re putting so much focus on it. During your furnace tune-up, our professionals run through a comprehensive inspection check to ensure that there are no places where your furnace may develop safety hazards, like a cracked heat exchanger or loose gas line. The peace of mind granted by maintenance makes the service worth it all on its own. When the temperatures drop down low enough, the last thing you want is to have to scramble to call for emergency repairs because your furnace has abruptly stopped working. We provide reliable and efficient repair services, however, we’d much rather help you avoid these problems in the first place if possible! A tune-up gives your heater the best chance of making it through winter without an interruption in service, and it stops smaller inconveniences that could eventually add up in money and time wasted. In fact, staying on top of your routine maintenance appointments can prevent 85% of the repairs a heater may need over the course of its lifespan. Speaking of that lifespan, did you know a well-maintained furnace can last 15 years or more? This is not the case, however, for a heating system that does not get the care it deserves, and a premature heater replacement is expensive! Maintenance helps your heater achieve the longest possible lifespan. A heater that doesn’t receive routine care and cleaning will begin wearing down sooner than one that does. With troubles such as extra friction on the motors and burners struggling to produce sufficient heat, the system will drain more power than it should need to in order to operate, increasing your heating bills. Maintenance helps your heater retain 95% of its efficiency throughout most of its lifespan. Furnace and heater warranties typically only stay valid if the heater has annual inspections and tune-ups from a licensed and approved HVAC professional. Make sure your heater keeps this important protection! See why our customers keep saying “I Love My Design Comfort.” Contact us today!